LES FEMMES - THE TRUTH: How Can Planned Parenthood Do It? They Have Killed Their Consciences! But these Lady Macbeths instead have turned their mothers' hearts to stone and willingly, even enthusiastically, engaged in human sacrifice. Like the Aztec witch doctors, they rip the hearts out of the littlest of God's little ones. It is hard to understand how such a thing happens to a woman, but a reading in Magnificat earlier this week made it a little clearer to me. They came to it by degrees, in stages as described by Fr. Peter Semenenko, C.R. a 19th century Polish theologian and co-founder of the Resurrectionists. Sin is progressive. At first, "The good in us is still strong enough to make itself felt and to draw us. We perform acts that are opposed to evil, and although the good does not rise on the scale, it is still strong enough to exert its pull on the individual." But then the sinner stops fighting against the sin and, "The battle has already ceased." The sinner knows she needs to change. "[S]he knows about good and theoretically desires it. [S]he is sorry for the evil [s]he does, but does not pick [herself] out of it." When the sinner reaches that point, [s]he is blind to good influences. "[S]he not only does not want to rise, but theoretically, good does not attract [her]." And here is where the sinner reaches the poisonous depths. "[S]he begins to justify [her] sin and to love it." Didn't we see that among the women as they engaged in chit-chat and particularly when Cecile Richards lied through her teeth about what they are doing? Father goes on. "[S]he has loved sin for a long time already, but now [s]he begins to identify [her]self with it." And here is where the sinner has become diabolical in uniting herself with evil. "Final identification with evil and, therefore, complete ignorance of good, complete dismissal and even hatred of good, a life of evil that regards itself as good and holy. The explanations offered are: 'This is the way it ought to be,' or 'This is how it must be.'" Yes, indeed, this is how it must be Planned Parenthood tells us -- freedom to choose to kill "without apology." Think of those videos of the women eating and drinking as they cavalierly discuss selling babies body parts. Think of them joking about eyeballs falling in laps and handling "cute" little hearts from dissected baby bodies. In Michael O'Brien's book, Father Elijah, there is a story within the story about a homosexual molester who is dying. He is the personification of evil as he spars with Fr. Elijah who is trying to save him from the grip of Satan. The man is clearly possessed and his vitriol and malevolence spew from him in a torrent of ridicule and abuse. The dark side of sin is clearly seen in him, deformed by his life of depravity. 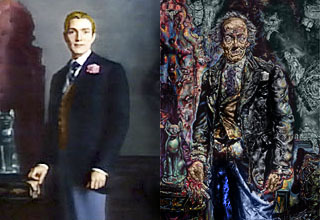 He is like the Picture of Dorian Gray in the attic. When the just are mercy needing?" But, of course, in their blindness, sinners in the final stage don't recognize a need for mercy. Frail men plead, but they will not because they are confident in their arrogance that they are justified and sinless. So we must pray and act like Fr. Elijah ripping a doomed soul from Satan's clutches at the last moment. That's what the Passion is all about after all, and we are called to participate in the Lord's saving action by praying and sacrificing for sinners. Seeing the reality of the little brothers hugging each other in their humanity warmed the icy heart of one abortion mill worker and helped her save others. Those babies were little apostles, witnesses. How many of us can claim that we have used our lives to witness as well as they did in their short time here? Let us pray that many eyes are opened to the reality of abortion before that cold and terrible day of judgment catches them unaware and they hear the Lord say, "Depart from me, you evildoers....As long as you did not do it for the least of my little ones, you did not do it for me."